Posted on Sun, Mar 18, 2012 : 5:05 p.m.
A rooster at Cobblestone Farm on Packard. If the wild rooster can adjust to the other animals, it will stay at the farm. Some Ann Arbor drivers saw a different kind of pedestrian walking down the sidewalk on Packard earlier this month — a black and gold rooster. While on her way home from work, Little Lamb Nursery & Kindergarten employee Mary Grace Argiero spotted the rebel rooster walking along Packard between Easy and Chesterfield. The rooster has been living on two residents’ land since September. Ann Arbor neighbors Carol Wallace and Hilda Ward have been opening their yards to the unlikely visitor. Roosters and hens at Cobblestone Farm on Packard. The few acres of land between their homes, located on Packard at Chesterfield, served as the roosting grounds for what Wallace called “a beautiful and peaceful rooster.” She and Ward had been feeding him and he slept in her pine tree nightly. 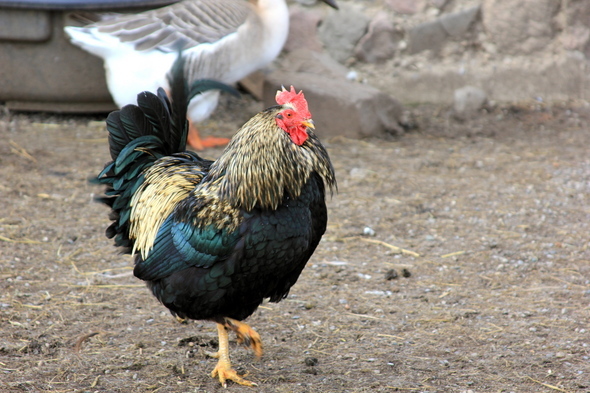 Jeff Straw, Ann Arbor's deputy parks and recreation manager, said the rooster wasn’t from Cobblestone Farm, where it was first thought to have escaped from. 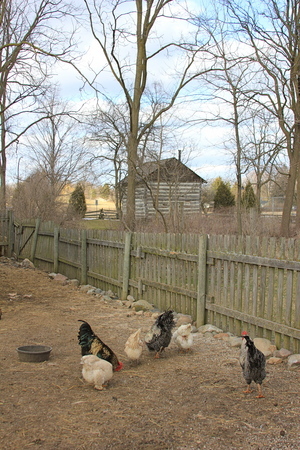 Cobblestone Farm houses roosters and chickens among other barnyard animals about a quarter-mile from Wallace's yard. Straw said the farm’s caretaker was notified that a rooster was spotted walking along Packard late last week and checked into it. “He offered to take the rooster for them and relocate it,” Straw said. “It seemed like they've kind of just taken it under their wing. "No pun intended,” Straw added, laughing. Straw said the caretaker took the rooster to the farm to see if it could adjust to being around other roosters and animals, but was told Wednesday it was aggressive around the unfamiliar animals. If the rooster doesn't adjust well, the caretaker will look for another farm for it, Straw said. Considering that Ann Arbor’s chicken ordinance doesn’t allow residents to keep roosters, Wallace said she is happy to hear the bird will be safe in an appropriate environment. She has seen the rooster stray into the road before and almost get struck by traffic. Mon, Mar 19, 2012 : 12:38 p.m. I wonder if this is the same rooster I saw a month or two ago. It was along Packard in front of a private residence a few blocks away from Cobblestone when I saw it. Mon, Mar 19, 2012 : 12:06 p.m. Anytime you put a new bird in with the flock they will fight. The best time is at night when the flock is sleeping. It has been my experience that they don't seem to notice the extra bird when they wake up. Mon, Mar 19, 2012 : 11:50 a.m.
Mon, Mar 19, 2012 : 1:42 a.m. I watched as the caretaker from Cobblestone Farm scooped up the wayward rooster. This was not an easy task as the tame, yet wary, rooster didn't want to be scooped up. The caretaker was amazing in his fearlessness and at the same time very gentle. (Who wants to be challenged by a large bird willing to use his beak and spurs to protect himself? Not me.) I am sorry that Hilda &amp; Carol will no longer see this beautiful bird in their yards but am glad that it has a chance to hang with others of its own species. It's easy to make jokes about chicken dinners but this was no ordinary chicken-slash-rooster. He's a beautiful animal and nothing like the domestic fowl that we think of when we think of KFC or the meat dept at the local grocer. Mon, Mar 19, 2012 : 2:39 a.m.
Don't egg me on. I've seen this rooster and he's nothing to crow about. Sun, Mar 18, 2012 : 10:59 p.m. Such a big deal about a rooster. There are lots of them in the poultry section of Kroger's! Sun, Mar 18, 2012 : 10:58 p.m. Sounds like a male dog's reaction to another male dog he isn't acquainted with yet, no matter whose yard it is in which they meet. Danny, is the word &quot;hen&quot; prohibited in journalism? You wrote &quot;roosters and chickens,&quot; not &quot;roosters and hens,&quot; as if roosters aren't male chickens. Yesterday, I did see a blue jay in the back yard, but haven't heard roosters crowing yet. Perhaps that's something they do only after the spring equinox, which comes next Tuesday.